Google Webmaster Tools Link Count Drop Continues: A Bug? Last Wednesday we reported complaints in the forums of webmasters noticing their links are dropping within Google Webmaster Tools. 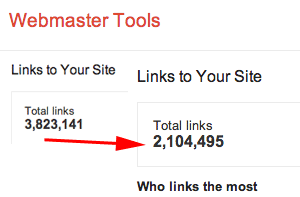 In short, the links shown in Google Webmaster Tools today versus two weeks ago was a fraction of the number. Well, the issue is still going on and now I see it also. More and more webmasters, site owners and SEOs are concerned about the link drop. Personally, as you can see in the screen shot, I dropped from 3.8 million links to 2.1 million links in just a few days. That is a 45% drop in reported links by Google Webmaster Tools. Others are reporting link drops as high as 80%. This is not uncommon, we had a bug back in February with this as well. So I would not worry, it seems like everyone is in the same boat. Most likely, this is a bug and will be fixed. But it may be a change to how Google calculates links, but that seems less likely. I'll try to get an answer on this. Forum discussion at WebmasterWorld and (one of many) Google Webmaster Help.